As promised yesterday, I’m posting the remaining portion of the similie sketches published in the early 1940s. 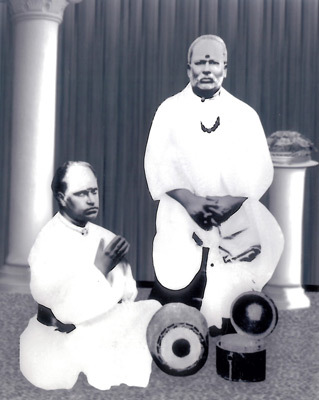 The song Manasuloni is often mishandled. Especially the word “marmamulu” is split wrongly as “mar” and “mamulu” to incorporate sangatis. This is a private recording of a teaching session to Smt. Gomathi where Rajam shows the right way to render the song despite the cascading sangatis. It is usually easy to identify Rajam’s works by just looking at them. The fingers, the lines, the eyes etc. are unmistakable. However, some rare works of his demand a relook to confirm that it was indeed done Rajam. Here is one such line drawing from Kalaimagal in the 1950s, illustrating writer Akilan’s story. Today I present a rare Anai Ayya Kriti in Dhanyasi. This again is a private recording. Each and every phrase drips with Dhanyasi. This recording without accompaniments should be useful particularly for students who would like to learn the song. Today I present a wrapper from Vanoli depicting Tyagaraja. Apart from water colours, Rajam sir’s was known for his portrayal through line drawings. This a good example for his steady yet graceful lines. Rajam sir was always looking to learn new compositions. It didn’t matter if it was a composition of old masters or his contemporaries or even his juniors. Here we present a composition of his slightly senior contemporary artist, G.N.Balasubramaniam in raga Sarangatarangini. A fairly detailed presentation with a short introduction. Today’s musical selection is the lovely alapana of raga Naganandini. What stands out is the effortlessness as he traverses the scale.